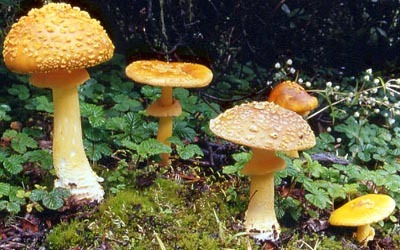 english name "Asian Yellow Dust Amanita"
1. Amanita flavipes, Yunnan Prov., China. The fruiting bodies of A. flavipes are small to medium-sized. The cap is 30 - 120 mm wide, convex to applanate, yellowish to yellow to yellowish brown to brownish orange, darker in the center, paler towards the margin, sometimes with grayish tints. It is covered with yellowish to yellow to yellowish white, occasionally whitish, floccose, felty, granular volval warts; its context is white to whitish. The gills of this species are free to subfree, crowded, white to yellowish; and the short gills are attenuate and of diverse lengths. The stipe is 40 - 150 × 5 - 20 mm, subcylindrical to attenuate upwards; its surface is white to yellowish to yellow, covered with yellowish to yellow squamules, and glabrescent; the stipe's basal bulb is 15 - 40 mm wide, subglobose to ovoid to ventricose, with the upper part covered with yellowish, farinose to granular volval remnants in a few concentric belts. The annulus is membranous and superior with its upper surface yellow to yellowish to cream and lower surface yellowish to yellow. The species occurs in conifer forest or in forests with oaks and conifers. Spores [East Asian] measure (6.5) 7.0 - 9.0 (10.0) × (5.0) 5.5 - 7.0 (8.5) µm and are broadly ellipsoid to ellipsoid and amyloid. 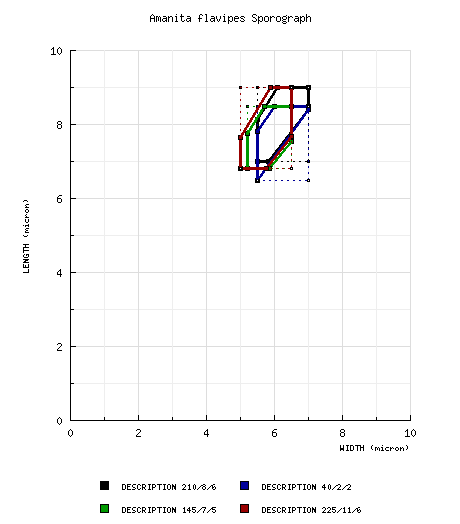 [South Asian spore measurements are as follows: (6.0-) 6.8 - 8.5 (-11.0) × (5.0-) 5.2 - 6.5 (-8.8) µm.] Clamps are not present on the bases of basidia. Amanita flavipes was originally described from Japan. The species is widely distributed in China, India, Japan, Pakistan, and South Korea. For comparison, see A. elongata Peck, Amanita erythrocephala Neville, Poumarat & Aste, A. flavoconia G. F. Atk., and A. flavoconia var. inquinata Tulloss, Ovrebo & Halling. author S. Imai. 1933. Bot. Mag. (Tokyo) 47: 428. ≡Amplariella flavipes (S. Imai) E.-J. Gilbert. 1940. Iconogr. Mycol. (Milan) 27, suppl. (1): 79, tab. 47 (fig. 3). =Amanita bella S. Imai in E.-J. Gilbert. 1940. Iconogr. Mycol. (Milan) 27, suppl. (1): 47, tab. 47(fig. 4). ≡Amplariella bella (S. Imai in E.-J. Gilbert) E.-J. Gilbert. 1940. Iconogr. Mycol. (Milan) 27, suppl. (1): 79. ≡Amanita pulchella S. Imai nom. illeg 1933. Bot. Mag. (Tokyo) 47: 427. =Amanita watlingii A. Kumar & T. N. Lakh. in A. Kumar et al. 1990. Amanitaceae India: 92, 112, fig. 18(A-E). 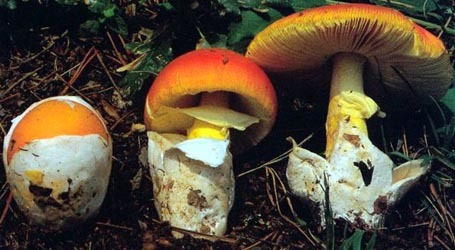 =Amanita flavoconia sensu A. Kumar et al. 1990. ibid. : 63, 99, fig. 5(A-E). non Amanita flavoconia G. F. Atk. =Amanita flavorubescens sensu Yuan & Sun. 1995. Sichuan Mushrooms: 495.
holotypes A. bella—in herb. S. Imai (SAP); isotype (fragment) in herb. Gilbert (lost). lectotypes A. flavipes—in herb. S. Imai (SAP); isolectotype (fragment), in herb. Gilbert (lost). lectotypifications E.-J. Gilbert. 1940. op. cit. : 174 (in caption to fig. 3). revisions Z. L. Yang. 1997. Biblioth. Mycol. 170: 202, figs. 169-172. Tulloss et al. 2001. Mycotaxon 77: 480, figs. 13-15.
selected illustrations E.-J. Gilbert. 1941. Iconogr. Mycol. (Milan) 27, suppl. : tab. 54-55. Imazeki and Hongo. 1965. Color Illus. Fungi 2: 41, pl. 12(fig. 75). Imazeki et al. 1988. Fungi Japan: 162. Any of the following material not directly from the protolog of the present taxon and not cited as the published work of Dr. Z. L. Yang or another researcher is based upon original research by R. E. Tulloss. NOTE: Spore measurements from papers by Z. L. Yang use his "Times New Roman" face for "Q" and "Q'"—respectively, "Q" and "Q." from Yang (1997): [210/8/6] (6.5-) 7.0 - 9.0 (-10.0) × (5.0-) 5.5 - 7.0 (-8.5) μm, (Q = (1.06-) 1.20 - 1.48 (-1.56); Q = 1.31 ± 0.07), broadly ellipsoid to ellipsoid, sometimes subglobose, amyloid, colorless, hyaline, smooth, thin-walled; apiculus small. from Yang (2002a): [40/2/2] 6.5 - 8.5 (-9.0) × (5.0-) 5.5 - 7.0 μm, (Q = (1.14-) 1.20 - 1.42 (-1.50); Q' = 1.28 ± 0.08), hyaline, colorless, smooth, thin-walled, amyloid, broadly ellipsoid to ellipsoid; apiculus proportionately small; contents ?not recorded; color in deposit not recorded. from Tulloss et al. (2001): [145/7/5] (6.0-) 6.8 - 8.5 (-11.0) × (5.0-) 5.2 - 6.5 (-8.8) µm, (L = 7.3 - 7.7 (-7.8) µm; L’ = 7.5 µm; W = 5.7 - 5.9 µm; W’ = 5.8 µm; Q = (1.12-) 1.16 - 1.49 (-1.69); Q = 1.27 - 1.34 (-1.38); Q’ = 1.30), hyaline, colorless, thin-walled, smooth, amyloid, broadly ellipsoid to ellipsoid, occasionally subglobose or elongate, often adaxially flattened, sometimes swollen at one end; apiculus sublateral, cylindric, narrow, sometimes prominent; contents mono- or multiguttulate, with or without additional small granules; white in deposit. Composite of data from India and Pakistan (RET): [225/11/6] (5.8-) 6.8 - 9.0 (-11.0) × (4.2-) 5.0 - 6.5 (-8.8) μm, (L = 7.3 - 7.9 (-8.2) μm; L' = 7.6 μm; W = (5.4-) 5.6 - 5.9 μm; W' = 5.7 μm; Q = (1.12-) 1.18 - 1.53 (-1.73); Q = 1.27 - 1.40; Q' = 1.33), colorless, hyaline, smooth, thin-walled, amyloid, broadly ellipsoid to ellipsoid, infrequently subglobose or elongate, infrequently reniform, usually at least somewhat adaxially flattened; apiculus sublateral, cylindric, proportionately small, infrequently rather prominent; contents mono- to multiguttulate; color in deposit not recorded. ecology from Yang (1997): Solitary or in small groups. China: At 1800 - 3300 m elev. In coniferous and mixed forest wtih Pinus and Picea speciesand representatives of the Fagaceae. from Tulloss et al. (2001): Solitary to gregarious, in mixed woods, mostly under conifers. Himachal Pradesh, India [Kumar et al. (1990a)]: At 2000 - 3200 m elev. In woods of Cedrus deodara, Picea smithiana and Abies pindrow or woods of C. deodara and Pinus wallichiana or under C. deodara or in dominantly coniferous forest of C. deodara and P. wallichiana with scattered Quercus incana. Pakistan: With A. pindrow. material examined from Yang (1997): CHINA: XIZANG AUTONOMOUS REGION (TIBET)—Linzhi Prefecture (also Nyingchi Prefecture) - Unkn. Co., unkn. loc., 3100 m elev., 19.viii.1983 Y. G. Su s.n. (HKAS 16414). SICHUAN—Liangshan Yi Autonomous Prefecture - Xichang (county level) City, Luojishan, 2000 m elev., 16.vii.1992 M. S. Yuan 1787 (HKAS 25764, as "Amanita flavorubens" in Yuan & Sun (1995: 495)). YUNNAN—Chuxiong Yi Autonomous Prefecture - Lufeng Co., Yipinglang, 1820 m elev., 26.vi.1978 Shengweizhan 786033 (HKAS 4530, as "A. aspera" in Zheng (1988: 120)). Dali Bai Autonomous Prefecture - Binchuan County, Jizushan, 3100 m elev. 17.viii.1985 G. P. Xiao 773 (HKAS 15417). Diqing Tibetan Autonomous Prefecture - Shangri La Co.(formerly Zhongdian Co.), Dabaosi, 3300 m elev., 20.ix.1993 M. Zang 12001 (HKAS 26990). Kunming (prefecture level) City - Unkn. District, unkn. loc., 3.viii.1995 M. Wang 1 (HKAS 32505). from Yang (2002a): CHINA: JILIN—Yanbian Korean Autonomous Prefecture - Antu Co., Mt. Changbai, s.d. Y. Wang 811325 (IFP), 811038 (IFP). from Tulloss et al. (2001): INDIA: HIMACHAL PRADESH—Chamba District - Kala Top, 16.viii.1985 T. N. Lakhanpal & A. Kumar s.n. (HPUB 3324 as “A. flavoconia”). Kullu District - Manali, 11.viii.1985 T. N. Lakhanpal & A. Kumar s.n. (HPUB 3176, n.v. as “A. flavoconia”; BPI 71985 as “A. flavoconia”). Shimla District - Chopal, 29.ix.1985 T. N. Lakhanpal & A. Kumar s.n. (paratype of A. watlingii, HPUB 3619, n.v.; paratype of A. watlingii, BPI 71992). UTTARAKHAND—Pauri District - Garhwal, Nagdeva-Jhandidhar, 23.viii.1993 V. K. Bhatt & R. P. Bhatt s.n. (GUH M-20069 as “A. flavoconia”; RET 300-3). PAKISTAN: NORTHWEST FRONTIER PROV.—Hazara District - Nathiagali, Kuzagali, 7.viii.1994 A. N. Khalid 781994 (LAH; RET 140-8). photo Zhu L. Yang - (1) Yunnan Province, China. select a collection to review/add spore measurements..#784571. Y. G. Su, #s.n., CHINA, XIZANG AUTONOMOUS REGION (TIBET), Linzhi Prefec..#784572. M. S. Yuan, #1787, CHINA, SICHUAN, Liangshan Yi Autonomous Prefecture, ..#784573. Shengweizhan, #786033, CHINA, YUNNAN, Chuxiong Yi Autonomous Prefecture..#784574. G. P. Xiao, #773, CHINA, YUNNAN, Dali Bai Autonomous Prefecture, Binchu..#784575. M. Zang, #12001, CHINA, YUNNAN, Diqing Tibetan Autonomous Prefecture, S..#784576. M. Wang, #1, CHINA, YUNNAN, Kunming (prefecture level) City, Unkn. Dist..#784577. Y. Wang, #811325, CHINA, JILIN, Yanbian Korean Autonomous Prefecture, A..#784578. Y. Wang, #811038, CHINA, JILIN, Yanbian Korean Autonomous Prefecture, A..#784579. T. N. Lakhanpal & A. Kumar, #s.n., INDIA, HIMACHAL PRADESH, Chamba Dist..#784580. T. N. Lakhanpal & A. Kumar, #s.n., INDIA, HIMACHAL PRADESH, Kullu Distr..#784581. T. N. Lakhanpal & A. Kumar, #s.n., INDIA, HIMACHAL PRADESH, Shimla Dist..#784582. V. K. Bhatt & R. P. Bhatt, #s.n., INDIA, UTTARAKHAND, Pauri District, G..#784583. A. N. Khalid, #781994, PAKISTAN, NORTHWEST FRONTIER PROV., Hazara Distr..